In producing promotional and advertising materials like table tents, you need table tent printing services that offer great deals. One of the great things about having your table tents printed with the help of a professional service is its cost-effectiveness compared to home printing. Table tents are normally ordered in large volumes from professional printing because the price of each piece goes down when you order more. Figuring the right shape and size when creating your table tent design is a difficult task because table tents follow a different layout unlike other print products. To make your job much easier, there are specific layouts or templates that you can use as guide when creating your design. Table tent printing services can provide you with layouts that indicate the folds and printable areas of table tents. All you have to do is fill in the template with your design before sending it to the online printing service for production. Lastly, ordering from online table tent printing services is a convenient way to order your promotional displays. You can choose your specs, get your printing quotation and send your design file online with just a click of a button! However, before anything else, you should research information about the online printing service and see if it offers the things you need for your table tents. Check the turnaround times for table tents on the site so you can estimate the arrival of your order. You can also view the Frequently Asked Questions (FAQs) page of the site to learn more about the company's products and services. 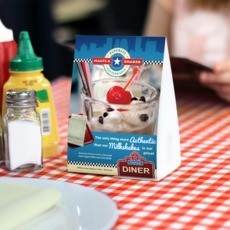 UPrinting.com offers you the convenience of online printing services and high-quality table tents. We use 14 pt. cardstock with glossy, matte or UV high gloss coating. Our digital printers can produce 50–200 copies while offset printers can make 250–10,000 pieces per order. For templates, you can download 10" x 4" templates from us to use as guidelines for designing your work. Got more questions? Call us as 1-888-888-4211 now!